Use the code EXTRA10 right now to save an extra 10% over at www.SMBBooks.com. For our friends down under, we're going to let that go through August 2nd in the U.S. There are lots of sales going on right now at SMB Books, so this is an additional 10% off the prices you see there. This sales is for everything and anything on that site. If you've been waiting for a sale, this is it. Lots of prices are going UP in September, including (especially) the big 4-book set. You know you are going to buy it eventually. You might as well do it now and SAVE! When we think about CRM - Customer Relationship Management - the classic tools have been ACT! and, more recently Salesforce.com (see www.act.com and www.salesforce.com, respectively). A CRM system tracks all aspects of client information, prospective sales, actual sales, marketing campaigns, the "sales funnel" for all sales representatives, and much more. Just as a technician lives inside the service board, your sales rep lives inside the CRM. 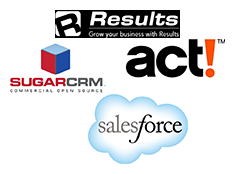 With modern APIs and the trend toward massive integration, CRM options have exploded. First, every good PSA has a CRM module built in. Second, there's been an explosion of low-end CRM tools such as SugarCRM and high-end tools such as Infusionsoft (see www.sugarcrm.com and www.infusionsoft.com, respectively). My favorite tools for integrating with everything in sight is Results Software (www.results-software.com). Results actually performs a two-way integration with each of your other tools. So if you change an address in Outlook, it will change that address in QuickBooks. As with the quoting software, you need to have enough volume to make a CRM purchase worthwhile. And like a quoting tool, once you start looking, you want to find one that integrates as fully as possible with all the other tools you've invested in. CRM used to mean primarily a system for keeping track of how you contacted people in your "prospect" database. ACT! made its name keeping track of this information. But modern CRMs are much more than that. Today your CRM can be used to keep track of marketing campaigns. You can see how many pieces of mail, and which pieces, were sent to a prospect. You can send your newsletters through the CRM system. In some systems, you can manage you social media presence, and actually schedule your postings on Twitter, Facebook, LinkedIn, and other social media from inside your CRM. Assuming you have a PSA, using the CRM module inside your PSA is probably the best place to start. Get used to tracking your activity. See what it means to track a prospect and an opportunity. Determine some best practices within your company regarding the CRM. As a built-in tool, the CRM module inside your PSA will be good. But it might not be great for your company and your sales force. You need to look your entire sales process and find a tool that works with the process you have - or the process you want to build. In one sense, a CRM will be a lot like a PSA: You will probably not use many of the features. So the best place to start is a thorough examination of how you want to market your business and make sales. Will you be using social media? Google ads? Email? Postal mail? Telephone calls? And so forth. If you are very happy with your PSA, your financial package, and your quoting tool, then first verify that any CRM you consider will integrate fully with those tools. Then consider how you have been marketing and how you plan to be marketing. Your CRM should excel at all of those activities. The biggest danger with a dedicated CRM (as opposed to using the one built into your PSA) is that both you and your sales people need to open it! Here's what I mean. Obviously, the marketing people need to use the CRM to get your message out and get the opportunities knocking on your door. Then the sales people need to use the CRM to track their calls, contacts, and proposals. But you - the owner or sales manager - also need to log into the CRM. If you are not tracking your marketing people and your sales people, then they will figure it out right away. I personally hate managing sales people. I don't want to talk to them about their targets or their progress. I feel like a parent telling the kids to clean up their room. But it's the nature of sales people that they need to be managed. Very few sales people are awesomely successful without management. That means someone has to log into the CRM dashboard and talk to them about the number of calls made, the number of appointments set, the number of proposals presented, the number of signed sales, etc. If you (or your sales manager) won't log into the CRM and track activity, then don't waste your money on a stand-alone CRM. When you truly outgrow the CRM that ships with your PSA, then you need to make the commitment to log into a separate tool and run reports on a regular basis. Unfortunately, there are some activities you cannot delegate. Tracking sales and marketing activity can only assigned to the owner or the sales manager, if there is one. So the bottom line is: Use your built-in CRM until you know it and use it thoroughly. If you need something "more" than that, choose a CRM that fully integrates with your other tools. And then commit yourself to logging in and making those sales happen! If you follow me on Facebook (and you should), you may have see references to a networking group I belong to called ULink Network. ULink (see http://www.ulinknetwork.com) is a different kind of networking group. Two things make ULink unique. First, it is a very social organization. Second, ULink members are connected with a web app that members can access on their smartphones. On the social side, ULink is the first business networking group created specifically to take advantage of the connections we are all already building in social media. For example, there are Facebook groups and even a "Member Marketplace" specifically for ULink members. On the technology side, the app is a great way for members to make referrals to one another. Imagine you are with someone and they ask you a very simple question: "Do you know anyone who does __________?" If you both have the ULink app, you can connect these two people with a few simple clicks.
. . . and there's a lot more. You can track whether your friend followed up on the referral. And when you have a good size network, you can search through your contacts to see who provides certain services. Next Tuesday I'm going to talk with the founders of ULink Network about a very special program they are putting together through the rest of this year. Unlike most pilot programs, this one could actually help you build your network and make extra money. And, to be honest, that's more than a lot of networking groups can say these days. Note: This product is due to be released on September 1, 2014. Order now to get the amazing introductory price. The normal bundle of four books will be $279.95. This is the super early-bird pre-release price. The price WILL go up September 1st when these books are released. August Price ONLY $199 for the set of four books. Almost every consultant we talk to or coach has the same issues: They need better procedures. They need better processes. They are too busy to create this stuff from scratch. Key pieces of knowledge are in one person's head (often the owner). That ties the owner to the company and limits growth. It also makes the owner the choke-point for everything in the organization. This four-book set will cover everything you need to set up, run, and fine-tune a great consulting business. See all the details - and table of contents - at http://sop4smb.com. 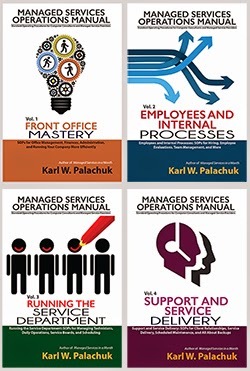 This is a truly comprehensive guide to Managed Services, Standard Operating Procedures, and best practices. The price goes up when it's available through Amazon, Barnes and Noble, and everyone else. -- Thank you for your support. SOP: Your Finance System - QuickBooks or Something Else? In small business, the most popular financial tool is QuickBooks. They may not be your favorite tool, but chances are very good that you are using them. QuickBooks integrates with just about everything and is "the standard" for small business finance. See www.quickbooks.intuit.com. You may be using FreshBooks (www.freshbooks.com), Business Works (http://na.sage.com/us/sage-businessworks), or some other package. In this book series we're going to refer primarily to QuickBooks since it has such a commanding market share (about 90%). The most important consideration when you choose a financial tool is its integration with your RMM and PSA - and to a lesser extent your quoting and CRM tools. Ideally, it will integrate with all of these. What does that mean? Integration means that APIs (application programming interfaces) are used to send data back and forth between various software packages or services. For example, you should manage your managed services contracts in your PSA. But when you send out invoices, they will automatically be entered into QuickBooks so that both tools (PSA and QB) are in synch. o Standard labor rates, after-hours labor rates, etc. When a new product or services comes on the market, you will frequently here the question, "Does it integrate with the PSA?" or "Does it integrate with QuickBooks?" Those questions really have to do with automated tracking and automated billing. If the new product has licensing, I want that licensing to be measured and invoice through my PSA and QuickBooks. The more automatic the better. Having said all that, there are lots of people who never fully integrate QuickBooks with their other systems. This is particularly true for those with very low volume sales. All it means when you are not integrated is that you need to track everything in the PSA and RMM and then fill out Excel spreadsheets to report all those things separately. In Volume One, Chapter Twenty we discussed the Managed Services Grid. You will want to keep a grid like this whether you integrate QuickBooks or not. I you don't integrate, you will need to generate invoice in QuickBooks that match the invoice produced by your PSA. At low volume, this is not a significant amount of labor. You may also choose to sell products and service without integrating with the PSA or Quoting tool. Again, at low volume this may be easier. But when volume goes up, you'll need to integrate at some point. The great promise of PSAs has always been reporting. Because you have essentially your entire business connected to that tool, you should be able to get some amazing information out of it. This has been the most disappointing part of the PSA experience for most users. None of them has great reporting. In fact, there are businesses that exist solely to help you get usable information from you PSA. QuickBooks, however, has some extremely good reporting. It's all financial, of course, but it's exactly what you need. You have to be responsible for entering the data correctly. But once you do that, the reports you can generate are an excellent snapshot of your business from various angles (sales, profit, EBITDA, labor, etc.). If a PSA is the tool you use to run you managed service business, the RMM - Remote Monitoring and Management - tool is what you use to deliver your managed services. While there are three primary PSA vendors, there are at least a dozen "primary" RMM vendors. The primary vendors are probably GFI Max, Continuum, Kaseya, and LabTech. As it happens, I have used all of these tools. Each has a different business model and pricing model. As of this writing, I am a GFI Max reseller, so take that as full disclosure. Your RMM tool basically allows you to "automatically" manage thousands of machines instead of the hundreds you might be able to manage manually. When we look at our Monthly Maintenance routine (see Volume Four in the about-to-be-released SOP series), we see all kinds of monitoring that we used to do once per month. A great example is free disc space. Now, with an RMM tool, we measure that every second of every day, all month long. Instead of once a month, it is monitored continuously. More importantly, we can monitor things like CPU usage, security failures, unexpected reboots, and failed services. Those things can be immediate threats to a business' uptime. A good RMM system will have a dashboard that lets you see the health of all of your client's computers at the same time. Red lights, yellow lights, and green lights. An array that lets you know whether things are working smoothly. In finer detail, an RMM will monitor millions of small things (really). These include tasks, services, patches, anti-virus, backups, email, web activity, attached devices, event logs, and lots more. And these happen all the time, in real time, across all client computers, devices, and telephones. Some people would argue that one RMM is pretty much the same as another. That might be true when you have ten computers to monitor. But when you have a thousand, or ten thousand machines, then you need something that's very robust, easy to configure, and that you can train your employees on. My personal preference is for a system that allows me to pay for just what I use, not buy 100 or 1,000 licenses at a time. All good RMM solutions have a remote control system built in. It might be a brand name you've heard of, such as VNC or Team Viewer, or it might be proprietary for the RMM software. In either case, you will find yourself using it a lot. In fact, many people avoid buying an RMM tool because they have a preferred remote control agent and use Microsoft's automated patch management. That can take you a long ways, but it really is the tip of the iceberg when it comes to RMM tools. Other key features that you need are real time chat or video chat while working with a client, and real time integration with the PSA tool. What does that mean? There are two primary integrations you should look for. First, there are real time alerts. When a server reboots unexpectedly, your RMM tool should open a ticket in your PSA so that you can investigate. You should literally know about it before the client does. Second, your RMM should integrate into your PSA. It should report the number of licenses in use. It should send information that can be used in a monthly or quarterly health report. The first priority of you RMM is patch management. The second priority is remote control. The third priority is integration with the PSA. If you're looking at an RMM tool, it should do an excellent job of these three things. Period. If it doesn't, go find another tool. In Part I - http://blog.smallbizthoughts.com/2014/07/trust-in-business-part-i.html - I introduced the four stages in a trust relationship: Meet, Vet, Establish, and Maintain. That articles covers the first three stages, all of which are about setting up the trust relationship. Now let's look at maintaining and transferring trust. It actually takes a lot of work to "set up" a trusting relationship. You have to go through several cycles of making promises and then keeping them. You need to set expectations and then deliver. And when you over-deliver, you build even more trust. One of the reasons that big corporations are essentially only sales operations is that there are very few one-on-one relationships with clients. Small businesses have it easier in that regard. 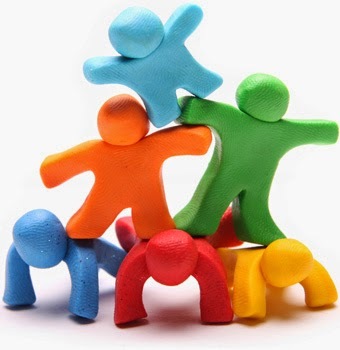 All client relationships start with a one or two people from each company trying to work together. Trust grows from there. If your company has a number of technicians or engineers that will service clients, you need to introduce them properly. This is the great promise of having employees: They will do a lot of the work. But you have to be careful how you "hand off" the client. You need to introduce the new employee. You need to literally walk into the client's office together and introduce them. Then you need to look into the client's eyes and tell them that the new tech is really good and will do a great job. It's always bad form to tell a small business client that you are going to send over someone they've never met before. Small business clients want to know who they're working with. You have to build a LOT of trust before you can send a stranger to take care of a client relationship just because he's wearing your company shirt. What you're doing with employees is delegating trust. Delegating means that they are working on your behalf. In the world of trust, that means that the employee is using YOUR trust equity to continue and manage the relationship. If the employee doesn't perform, you lose some of that trust equity. That's the danger. On the up-side: When an employee does a great job and really impresses the client, three things happen. First, they begin to build their own trust relationship. Second, they help you maintain your trust relationship with the client. After all, you said this was a good tech and you delivered. Third, some trust equity is transferred from your personally to your company or brand. Branding is all about expectations. Consistency in performance goes a long ways - even if it's delivered by someone other than you. If you work at it long enough, you will be considered part of the client's team. That means that you will be invited to sit in on important decisions. Your input will be sought and your advice taken seriously. It's hard for you to force that stage of the relationship. Holding regular roadmap meetings will help a lot. If you invite yourself in and then avoid sales talk during the roadmap meetings, the client will see you promise to be strategic and then follow through on that. Eventually, they will invite you it and trust you to keep it strategic. The more involvement you have and the more "layers" of connection with the client, the harder it is to delegate trust. Even if the client completely trusts your team for technical support, that doesn't guarantee trust with regard to strategy and planning. In addition, gaining the trust of your primary contact is not the same as gaining the trust of the owner or the majority of end users. Everyone needs to have experiences that allow trust to grow. Here and there you can delegate trust up and down the org chart. But most of the time, most of the people will need to have their own experiences that allow trust to emerge for them. I have quite a bit of personal experience with this one. I have worked with companies that have been bought and sold. I have helped companies buy and sell pieces of themselves. And I have been involved in selling my own business. There are two primary kinds of trust that need to be conferred when you sell a business: Personal trust and service delivery trust. If you have personal relationships with your clients, they are far more likely to stay with the company after it has been sold. But that means YOU might have to stay around for awhile as well. When KPEnterprises transitioned to America's Tech Support several years ago, we took two huge steps to pass along trust and maintain clients. First, Mike and I wrote a letter to clients and described what was happening. We assured them that we were going to sit in the same seats, in the same offices, and do the same things we always did. The only difference was that Mike was going to be the owner and I was going to be the senior engineer. Second, we set up meetings with the clients who had personal relationships with me. That was about 90% of the clients who had been with us for two or more years. Mike and I both met with them. We basically made the same promises that were in the letter. But we looked them in the eye and assured them that everything was going to be great. They all knew Mike. Now he looked them in the eye and said the words "I'll take care of your business." Time and again I've seen businesses go downhill after being sold. They lose clients who have with the company for five, ten, or fifteen years. Personally, I think this almost always do to mis-handling the trust part of the relationship. Either the buyer and seller did not manage the hand-off properly, or the buyer failed to focus on building his own trust equity. It is very common that a business sale includes a requirement that the old owner stick around for some period of time. The excuse given is stability. But, really, it's the stability of the trust relationships more than anything else. Very often, a piece of the sale price is tied to continued revenue from existing clients. If they all leave, the seller receives less money. So he sticks around to maximize his return. The other big failure is the failure to maintain the trust that has been built into service delivery. The only way the new owner can build and maintain his own trust equity is through performance. He has to deliver the kind of tech support the clients are used to. He has to build the relationship on his own, because the delegated trust only lasts so long. As it fades, the new trust relationship needs to grow in its place. I heard a new owner say one time that he didn't want personalities to be part of the equation. He had contracts with clients. He would deliver services. They would pay their bills. It should be that simple. Maybe. But it's not that simple. If your business is built on service with no relationships, that means no trust. You are a stranger. And if you stay a stranger, then that client is never "your" client. They are just "a" client and you are just "a" vendor. Clients can always give their money to strangers who make better promises. What strangers can't do is to build instant rapport and instant trust. Got some memos from the folks at SMB Nation. The big Fall event is in full swing. Registration is open. And the good hotel rates are good through August 28th. The primary site for the conference is http://fall2014.smbnation.com/. The primary site for the pre-day event is http://www.smbpreday.com/. The content. The relationships. Time with greatest technology minds around. We are excited to announce that this year’s conference is focused on Office 365, as well as growing your business with new opportunities. 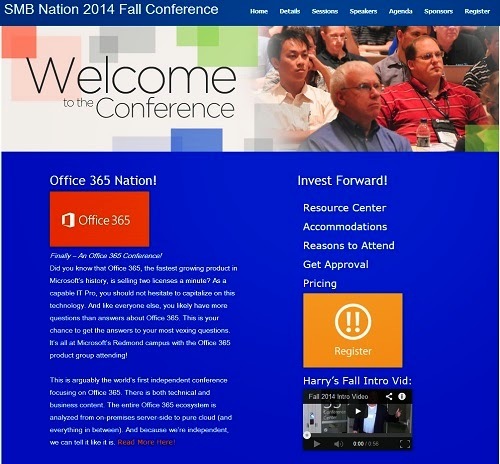 Below, you can see the sessions so you can get an even better idea of what the SMB Nation 2014 Conference will do for you. Of course, the awesome sessions are reason enough to attend, but don’t forget about the hallway networking, exhibit hall, and incredible speakers and more all add to the experience. Be sure to attend and get your questions answered, learn something new, meet some experts and your peers by attending the SMB Nation 2014 Fall Conference. Have you registered? If not … seriously, don't wait any longer. Early bird pricing is in effect now through August 29th, 2014. If you are an Alumni, or you're looking for a good deal, please contact us at: ednas@smbnation.com for a registration code! If you have any questions, or if you need assistance with registration, please give us a call at 206.201.2943 and ask for Edna. My SMB Preday event - my 10th Annual SMB Preday event - will be September 25th in Redmond. This will be an awesome event whether you attend live or get the recordings. Details at www.smbpreday.com. Attend one or both - and I'll see YOU in Redmond next month! In Volume Two, Section II of the new books on SOPs, we'll look at some important tools you need for running your company. The one tool most specifically designed to help you build a technology consulting business (computer consulting, managed services, tech support, etc.) is a PSA - Professional Services Automation tool. No matter how large or small your consulting business is, you should have a system for tracking all this stuff. A PSA designed for your business is a great investment. I encourage you to check them all out and determine which is best for your company. You should also talk to other IT professionals and see what they are using. There are dozens - maybe hundreds - of other tools that claim to help you run your consulting business. But my experience is that all of the others are lack some very significant features. They might be excellent at managing the help desk, but don't integrate with QuickBooks. Or they are primarily a CRM (customer relationship management) tool and don't integrate contract management or employee time tracking. 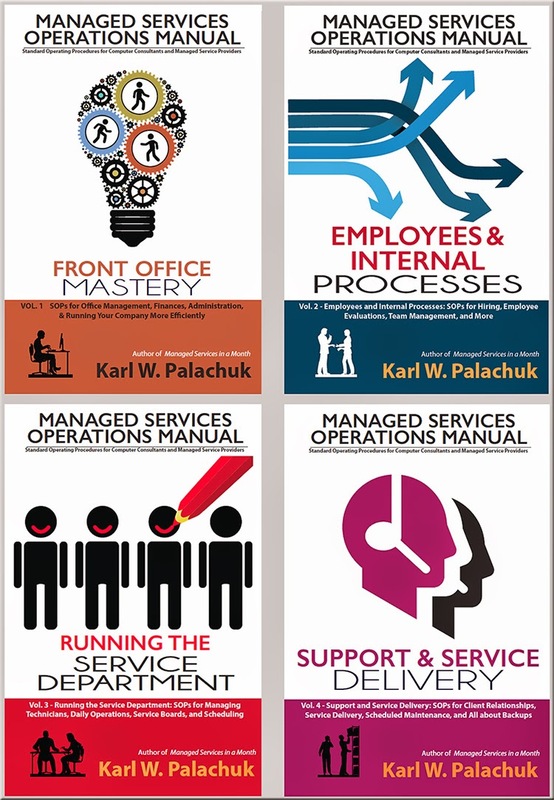 When you get to the next two books in this series you'll see that we use the PSA for almost every aspect of running the IT service business. And by the way, don't worry about making a mistake. Your business will be much better off as soon as you invest in any PSA and begin using it to run your business! You can change brands. I have.